French Pyrénées, proper cold weather at last, with my new peacoat, Uniqlo (green, of course) rollneck and LVC's cord sta-prests. Boots, courtesy M Moustache. Well done senior Sydney , braving the cold in your classic outfit , very smart sir. I have a similar outfit myself but yesterday I wore my Solovair boots to take a walk up the Braes and through the woods. .
. .did I tell you l saw my first live badger last week(not Hinault). . I don't beelieeve it! Ye forgot tae credit the bunnet. Like the "green of course" peacoat reference. I hate the winter and avoid cold weather like the plague but I was fantasizing the other day about putting together a winter outfit for some future visit home some Christmas that still maintained a slice of Mod influence, and it wasn’t far away from what you’ve done there. I was thinking about wandering the shops around Christmas, going to the match on Boxing Day, maybe getting out of the city and doing some brisk hikes around my sister’s cottage in the Yorkshire Dales etc. I can’t justify a winter coat now but if I ever did it would be a pea coat. I saw some lads online discussing the most desirable US navy vintage that gave the heaviest gauge wool so that’s what I’d go after. I’d likely pair it with some kind of merino jumper (or maybe cotton as easier to wash) - possibly a roll neck for that naval influence but I’d be sweating with that once I got indoors (who was that comedian who said wearing a roll neck was like being strangled by a weak midget?). A scarf and crew neck would be more versatile. I said before on here that I once saw a pair of brown/burgundy Peal and Co. chukkas in BB in scotch grain with a dainite sole and thought them possibly the best winter footwear. Meermin now do some similar at a fraction of the cost which I may avail myself of one day. I already own some heavy chinos, or better yet I’d get a pair of those Lands End ones with the checked flannel lining. At the extreme of weather, style has to take a back seat to comfort, but within those extremes it’s possible to put together weather-specific outfits and still maintain style and you’ve done this admirably here Sr. G! Serviceable and smart mate. Like it a lot. Wouldn't look out of place in a film about our old Great Train Robbers or something like that. Spot on. @Laird, I appreciate your comment, but the green one is the Uniqlo rollneck, not the peacoat (that's a medium grey in fact). The cap was a gift from my missus, a Stetson. @Simon, don't get too close to one of those, they bite (neither talking about Hinault)! @Mart: yes, not especifically mod, more of an "under the radar", timeless outfit. So hombre, the question remains then , where did the p-coat come from and is that covered buttons on it. .
Well spotted, mr. Bond (or is it mr. Holmes? ). But though they look like covered buttons, they're in fact the traditional anchor ones. Now that I think about it, covered buttons in a p-coat would be a classy detail (tho' I really don't care too much for them in jackets). Re. the peacoat, it's been on my list for quite a while (since the last one gave up the ghost some years ago), so I've chosen it carefully from the wide range of options on offer (every brand seems to be making peacoats these days). There were some requisites, of course: the colour shouldn't be navy blue, like the couple peacoats I've had; the vertical pockets had to be arrow-shaped; there had to be at least 50% of wool in it; and the price couldn't exceed 100 €. The new Mango Man peacoats fulfilled every condition so I opted for one of them: 3 or 4 colours to choose from, 70 €, arrow-shaped pockets and 53% wool. I'm pretty happy with it regarding fit and warmth too. 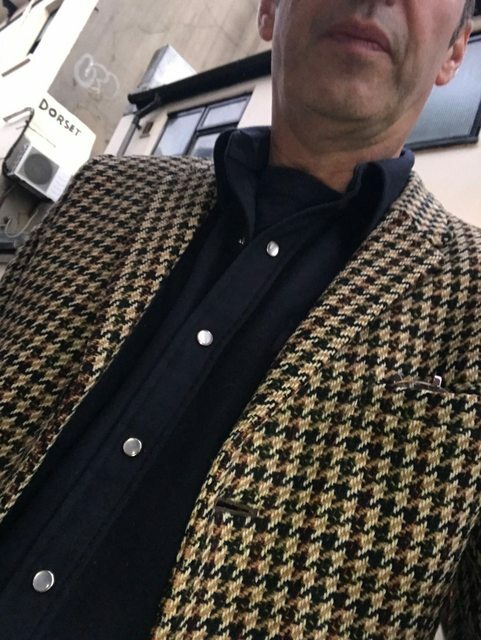 Pendleton wool shirt with MOP snap poppers (slightly Western) and Vintage tweed 3 button jacket.